Drumming and percussion transcends all cultures and time. 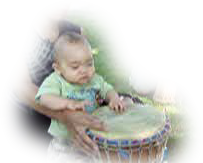 Rhythm is the basis of all music--once one has an understanding of playing rhythm, learning other instruments comes more naturally. Drums (for the most part) have less technical components than other instruments. They make LOTS of noise!